The seemingly never-ending shopping lanes, the search for the best dim sum and, of course, the lavish horse racing days have always made Hong Kong one of the hottest stops in Asia. But Sham Shui Po, they say, is where you go to experience the real Hong Kong. Take the 30-minute train ride – their public transport was rated world No.1 by CNN in 2017 – and you’ll be whisked to a modest, if not poor, neighbourhood that feels a world apart from the city. It won’t take long to fit in with the locals, however – especially if you begin your visit with a foodie tour. At the family-owned Lau Sum Kee restaurant, a newspaper clipping with a photo of Anthony Bourdain – who visited before his death last year – is proudly displayed on the front window. If you peer through, you’ll find matriarch Mrs Lau kneading noodles. It’s what she’s been doing since her husband brought his three-generation-old methods over from Guangzhou in the 1930s, which resulted in today’s shopfront on Fuk Wing St. The Michelin-recommended eatery, where the dry shrimp roe is its most popular dish, is famous for making its noodles with a bamboo pole. “It’s always good to keep the special technique. This is a family tradition; it’s always best to pass on to the kids otherwise it’ll lose its meaning,” Mrs Lau says via a translator. Like many of the family-owned shops in the district, the restaurant’s life-span relies on an offspring to inherit the responsibilities. Lau Fat-Cheong reluctantly took over when his father fell ill around the time he finished school, and Mrs Lau, who bore five kids, is banking on one of her grandchildren to keep the shop alive. “I have a 17-year-old granddaughter but she’s not into the food business. It is better if you have a big family so that it will be passed on to at least one,” she says. 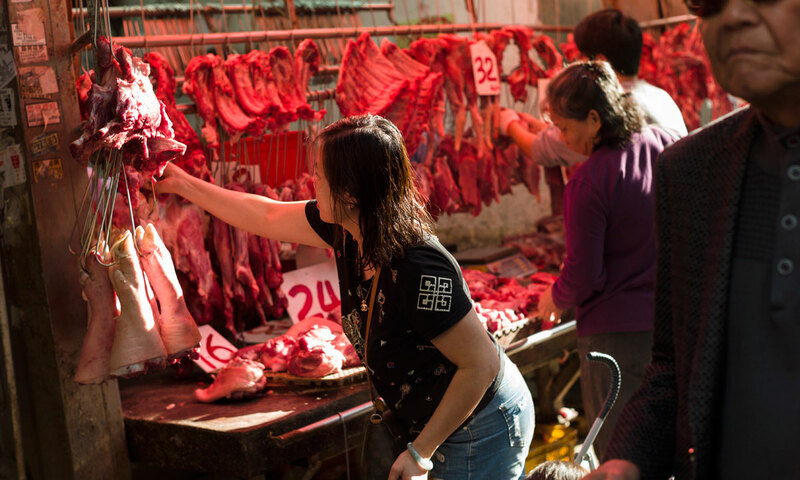 The family business is a theme that runs through just about every corner of Sham Shui Po. From wet markets, to haberdashery stores and second-hand (and maybe third-) goods stalls, there is a rich sense of family history waiting to be discovered in every street. Often people are literally waiting to tell you the story. “That’s what’s so interesting about this neighbourhood,” says Patricia Choi, who runs Wontonmeen, a creative residence in a 11-storey high-rise built by her grandfather. Like Lau Fat-Cheong, Choi was an unwilling resident of Sham Shui Po. Having moved into the building to be closer to the city where she studied interior architecture, there were often times she felt unsafe. Even her mother feared for her daughter’s welfare. She says she never tried to understand the neighbourhood, at least not initially. But she slowly pieced together a hub for aspiring creatives; a community to beat the ever-rising rental affordability crisis. Wontonmeen now features a coffee shopfront, funky communal space, and a 12-bed hostel. Controversially, each bed is designed with cages in reference to a sensitive period as recent as 20 years ago where low-income people lived in caged beds. Admitting she grew up in a middle-high-class family, Choi says her first resonance with what some have labelled “coffin homes” came from the film Cageman in 1992. “My impression was this community of single men taking care of each other. So I guess my impression of caged homes were a bit romanticised,” she says. She believes it was a clever move by government officials at a time when Chinese migrants flocked south in the ’60s. While Choi has never promoted the beds as a “caged home”, she describes them as “authentic”. “The mesh also provides ventilation and flexibility depending on one’s preference on privacy. It is also functional as hangers of one’s personal items,” she says. Cathay Pacific flies to Hong Kong from Sydney, Melbourne, Brisbane, Adelaide and Perth. Visit cathaypacific.com. 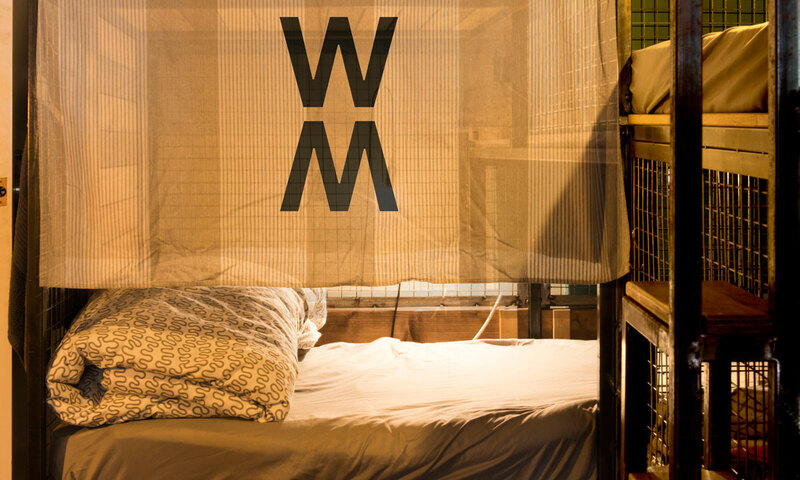 A bed at Wontonmeen hostel will set you back around $A40 a day. For a more upscale experience, the Jervois hotel in Sheung Wan is away from the hustle and bustle of central Hong Kong. It’s part of the reputable National Hotels chain, with rooms from around $A350 per night (they come with their own travel phone). Lau Sum Kee Noodle, a Michelin Guide restaurant on Fuk Wing Street, is so traditional it doesn’t appear to have a website. Thankfully, the locals can point you in the right direction. Honbo is the brainchild of a former general practitioner who has set himself the audacious goal of creating the world’s best burger, and he believes he’s got one in a neat little shopfront in a redeveloped pocket of Wan Chai. For more info on Hong Kong, visit http://www.discoverhongkong.com/au/index.jsp.